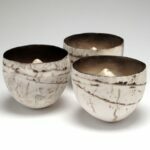 My ceramics are an expression of my love for the natural world and the vessel forms created by nature. I produce handbuilt pieces with an organic quality, marked by the elemental forces of fire and smoke. I handbuild from a mixture of stoneware and porcelain clays, using a combination of pinching, pressing and scraping techniques for my small vessels, moulding and coiling for my large vessels.